I've been thinking about this one for a while, but haven't been quite sure how to approach it. The homebrew stats for the AT-AA aren't really all that impressive; a 1/3 RoF and a pathetically short range make this thing a sitting duck for most starfighters, which can snipe it with torpedoes and missiles from outside of its own range. A simple tactic would be to induce it to open fire once, then use the intervening two rounds to close with it and destroy it before it can fire again. There is also some discrepancy in the official material as to the length. One source puts it at 22.3 meters, while another puts it 18. So, I'm going to redo the stats for the AT-AA, both to fit my Scale system and to make it a much more formidable anti-aircraft weapon. Version 1 will be the shorter, at 18 meters long, and will be equipped with a quadruple auto-blaster, which is the most formidable anti-starfighter weapon system I wrote up for my ASC system. Version 2 will be a mobile projectile artillery weapon, with the greater length (22.3 meters) used for weapon storage. It will be able to fire the direct-fire flak rockets used by the official version, but can also fire guided torpedoes and tube-launched artillery missiles. The rough idea is that both versions will operate behind and in support of the main battle line of AT-AT walkers, with the auto-blaster variants engaging any aircraft that attempt to attack the walkers, and the artillery variants firing whichever weapons are appropriate at targets of opportunity, whether starfighters, airspeeders, or ground targets designated by forward-deployed AT-STs. I'll be posting stats for the auto-blaster version first, since it's a simpler proposition than the artillery variant (which will also require stats for the various artillery shells), but it'll take a bit. The All-Terrain Anti-Aircraft Walker is the Empire's premier anti-aircraft weapon for ground assault. While its weapons lack the striking power of dedicated assault walkers like the AT-AT, the AT-AA's quadruple auto-blaster and guided concussion missiles are powerful enough to take down all but the most heavily armored starfighters and accurate enough to engage airspeeders. Combined with powerful sensor systems and a fire control jamming emitter for defense against enemy attackers, the AT-AA is a formidable and highly effective weapon. It is commonly deployed in support of an AT-AT strike force, operating ~1 kilometer or so to the rear of the AT-ATs, engaging any starfighters or airspeeders attempting to attack the AT-ATs themselves. Because the AT-ATs are so heavily armored, they can shrug off hits from the auto-blasters, which simplifies things greatly for the AT-AA gunners, as they can engage targets at will without having to be concerned about damaging the walkers they are defending. Fire Control Jamming: -1D to Fire Control of any enemy targeting the walker. -3D if jamming is directed into a single fire arc. Capacity: 16 (Central Magazine). May select Missiles from this list, depending on Availability. Locking onto a target allows the stabilized auto-tracking function of the auto-blaster to more precisely track its target. Time To Use: 1 standard action. -The Lock-On holds until deactivated or successfully evaded. On a successful evasion, the gunner must roll again to reacquire the target. Very nice.. Loved the snippet at the end about "Cause of the heavier armor of AT-ATs they don't care about being pinged by friendly fire.. Since my Scale system puts Walkers 2D over Starfighters, a 5D Starfighter-Scale Blaster can only do 3D Walker-Scale damage. Even with the Auto-Fire dice added to damage (at Short and Point-Blank Range), it can inflict a maximum of 5D Walker-Scale. It'd have to really work to damage an AT-AT. It's the Imperial Heavy Artillery Platform from Force Commander. Notice the similarity of the pod on the back to the same pod on the AT-AA. This backs up my idea of having two different versions of the AT-AA, with one for artillery. The same would hold true for the repulsorlift side of the army, who could field a repulsor-driven platform that could perform either AA or artillery support duties. And, since we've finally produced workable ballistic artillery rules, here is the Artillery variant of the AT-AA. Based on a stretched AT-AA chassis, the AT-AV is the Empire's standard artillery support vehicle for walker units. Equipped with a quartet of Heavy Mass Driver Cannon, the AT-AV can hit targets up to twenty kilometers away. In addition, the cannon can be used in direct-fire mode, firing high-velocity armor piercing or flak rounds. The AT-AV is 4.3 meters longer than the AT-AA; the extra volume was needed to handle the central magazine that feeds the cannon. It also mounts a dual blaster cannon in a ventral turret for close-in defense. Anti-air and counter-artillery fire defense is usually provided by attached units of AT-AAs. 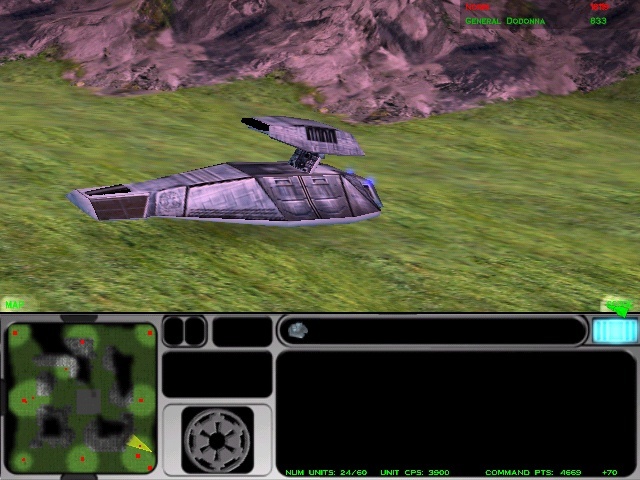 The AT-AV generally operates several kilometers behind the front lines, depending on AT-STs, Hoverscout, Probe Droids and other platforms to serve as its eyes. Scout and reconnaissance platforms are equipped to designate targets for artillery units, allowing batteries of AT-AVs to engage enemy vehicles and positions far beyond its direct line of sight. Special: Because of their configuration, the cannon must fire at the same target, but can vary how they are linked. This is particularly useful when firing two or more types of rounds, such as using two barrels to fire Proton Shells while reserving the third to fire Flare Clusters or Baffler Shells. If two or more barrels are fire-linked together, they receive a Coordination Bonus; +1D for two, +1D+2 for three, and +2D for all four. Special: +4D to Fire Control if Target is using Active Sensors or transmitting on Comms. Special: +4D to Fire Control if Target is being "painted" by an Active Sensor Lock-On from an allied unit. Special: On a successful hit on a Shield, roll Damage against just the Shield Dice, then apply the Controls Ionized modified to the Shield Strength. Effect: -4D to Sensors and Communications in affected area. Fire Control: +3D (may be fired at individual aircraft, or at a group of aircraft in close formation. On a successful hit, damage is rolled against all ships in that formation). Effect: Increase Terrain Difficulty in the Target Area by +10. All characters and vehicles entering the area must roll the appropriate Movement skill against Terrain Difficulty. If they succeed by <10, they hit a mine for 5D Damage. The AT-AV can not fire its mass driver cannon while moving. When preparing to fire, the walker positions its legs to provide maximum stability when firing, and then adjusts to compensate for recoil between shots. This system requires 2 rounds to activate, and the walker can not move while it is engaged, but receives a +1D bonus to Fire Control due to the added stability. I always thought the AT-AA was a kind of Crab looking like walker (ala Empire at war)..
And i like the new version. Very impressive.